Standing tall amidst Anime's ALL TIME Greats. There are Animes that come and go...some stick around a little bit longer in the mass majority's mind than some others do, while some are immediately forgotten. And THEN, there's Cowboy Bebop. Shinichiro Watanabe created an all time legend upon His completion of this groundbreaking mid-1990's title...And for all of those who KNOW Cowboy Bebop, they know that each and every little bit of positive exposure and 'talk-up' that this Show gets, that it is more than 110% deserving of EACH and EVERY single last little bit of it. Love, Friendship, Heartbreak, Envy, Revenge, Sadness and Sorrow prevail throughout this almost "Noir-film" gem of Art and introductions to styles that would never long be forgotten. While SOME Episodes may feel as if they are a bit slower than others, you need not fret because EACH Episode has SOME piece of absolutely amazing Story that you are able eventually to look back at, and have come away with after having watched...Cowboy Bebop - It's synonymous with an industry as well as a generation. I was 11 years old, my family and i were staying in a casino resort, obviously i wasn't allowed to do much, so i stayed in our room. My sisters went to the pool but i decided to stay behind, not knowing my life would change because of my lack of swimming at 10 o'clock at night. i think i watched a few hands of Texas hold'em poker tournaments before i stumbled onto adult swim. it was then after the commercials that i saw a beautifully animated space ship flying low over an ocean/bay of some kind, with bebop jazz furiously playing in the background. the scene quickly moves onto a close up of a pistol firing, "this isn't a cartoon, cartoons are for kids and this isn't for kids" i thought in my head. i wasn't too concerned, the show had me under its control like a puppet on stings. i had to know what this was, i had to find out more. 2 words that made little sense together became a new genre onto itself, that genre is called Cowboy Bebop. every time i reminisce about the first time i saw this show, i fall in love with it all over again. 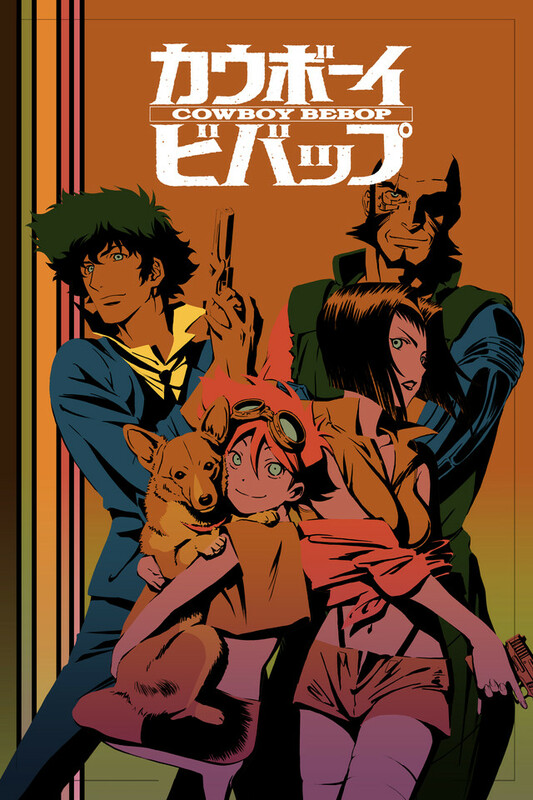 My love for jazz, mobster movies, noir, sci fi, and space operas stem from this, and the main reason why i watch anime even today is because im chasing a dragon, trying to find that same emotion that Bebop gave me 12 years ago (although FLCL got very close, another all time great anime thats a must watch for ANYBODY, not just anime fans), i seriously implore you watch this show ( in English dubbing if possible as its the best version) and perhaps buy the blu ray so you can watch it when the desire comes, which it will pretty often. i watch this show in its entirety at least once a year. you might see something different everytime, or you might see the same thing a thousand times, but you will love every second of it everytime. This show is perhaps one of the best things I have ever watched. Every element comes together perfectly to form an incredible experience, with the atmosphere, the universe, the characters, and the music especially. It starts off strong, and maintains that the whole way through, with only a few episodes with a filler vibe, and even then they are still unique and memorable. I could go into greater detail, but this is something you should watch, not be told about. An absolute must watch for anyone. It's Cowboy Bebop. It's the best. This is arguably the greatest anime ever created. People act like people, no cliche garbage, creative characters, creative setting, great voice acting, beautiful animation and art style, fantastic story, fitting opening and closing credits, and it's something you can watch with people who don't normally watch anime. Maybe with this you can even show them that anime is just another style of media and not a niche category. Cowboy Bebop was the first anime that really blew me away and became a gateway from watching anime such as Cardcaptor Sakura, Sailor Moon, and Dragon Ball in my childhood to getting into more adult titles such as FMA Brotherhood, Death Note, and HunterxHunter 10 later in my life. It was the first anime that convinced me the genre as a whole had something unique going for it, that anime has qualities that separate it from all other audiovisual works. It is a show that has withstood the test of time and is often viewed as a masterpiece. With wild and beautiful visuals and a thoroughly enthralling soundtrack, my overall opinion is that Cowboy Bebop is in multiple ways a masterpiece. A must watch for any self-proclaimed anime lover. This is a must watch... Been around for years, has a real story line, and depth unlike most of the newer shows and movies today... Graphics or paint should be easy on the eyes even for someone new to anime. Are you in it for the money? Looking for Adventure? Need to see some good ol a$s woopin? This is for you.